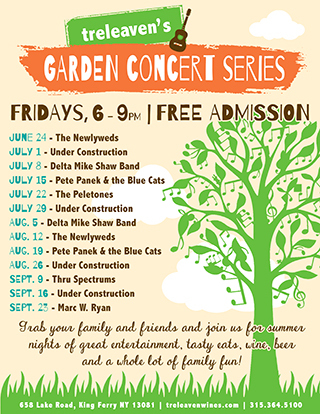 Celebrate summer and swing into the weekends with live music every Friday at Treleaven’s Garden Concert Series. Beginning Friday, June 24, Treleaven will launch their annual music series, which will feature performances from a rotating roster of musicians, kicking-off with The Newlyweds, Karen and Joe Lonsky. While enjoying mouth-watering fare from local food vendors, along with Treleaven wines and beer, guests can watch and listen to live music each Friday from 6:00PM - 9:00PM with no cover charge. Starting July 1, entertainment will take place in the brand new 40x80 pavilion, The Hangtime, and lawn games will be in full swing. The series presents a variety of music to satisfy all tastes - from classic rock to bluegrass to swing. See below for a complete list of musicians and food vendors. In case of inclement weather please call the winery at 315.364.5100 or check our Facebook page for more information and last minute announcements. * No outside food or alcohol will be permitted. * Seating available on a first come, first served basis, but you may bring your own blankets and chairs. The oldest winery on the east side of Cayuga Lake, Treleaven has been crafting fine vinifera wines and fun proprietary blends since 1988. Along with two flagship varieties, Riesling and Chardonnay, they are also well known for their hearty reds, like Cabernet Franc, Pinot Noir, and Merlot and fun, fruit-forward wines. Browse the extensive gift shop featuring local and handmade products, join in for one of the many special events held throughout the year and enjoy a glass of wine in the spacious outback. The Treleaven family invites you to taste the award-winning wines in a casual and friendly atmosphere - once experienced, never forgotten.